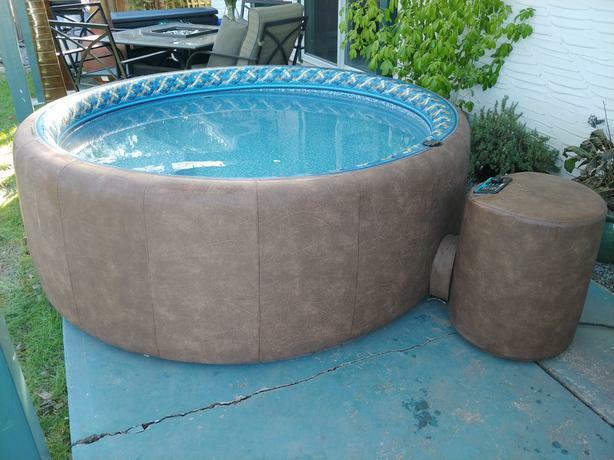 This is the largest Softub available but also one of the most portable hot tubs available. If you have a 110v outlet, this tub will work for you. The tub weighs 80 lbs empty so can be moved easily into difficult locations. It has a BRAND NEW perfect liner and a bi-fold lid with new light weight foam inserts. The motor has just been serviced with new seals, hoses etc. Great family sized unit, easily accommodates 4 people! Has one large comfortable seat and the ability to heat the water to 108F. Come have a look! Delivery can be arranged as well.